Over the last few weeks a number of UK friends have been commenting on the hot weather in the UK. They really don't have much on the UK. A point that was made clear today as we get the first Heat Advisory for the year. The UK has NOTHING on this baby! 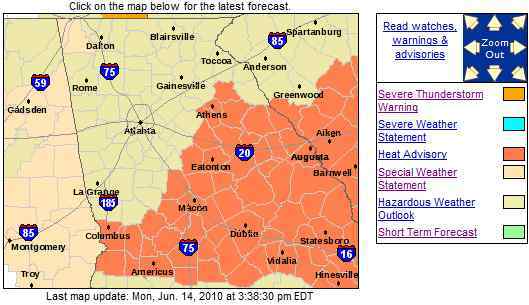 THE NATIONAL WEATHER SERVICE IN PEACHTREE CITY HAS EXTENDED THE HEAT ADVISORY AND IT IS NOW IN EFFECT UNTIL 8 PM EDT TUESDAY FOR AN AREA GENERALLY ALONG AND SOUTH OF A LINE FROM COLUMBUS TO ATHENS. HIGH TEMPERATURES TODAY AND TUESDAY WILL REACH THE UPPER 90S TO AROUND 100 DEGREES. 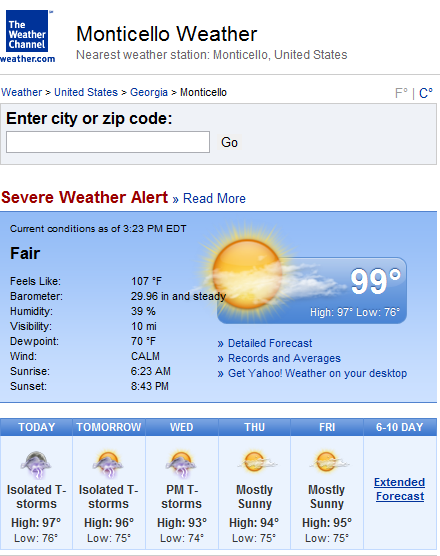 THE HEAT INDEX OVER PORTIONS OF CENTRAL GEORGIA IS EXPECTED TO RANGE BETWEEN 105 AND 110 DEGREES. AS A RESULT...A HEAT ADVISORY HAS BEEN ISSUED. A HEAT ADVISORY MEANS THAT A PERIOD OF DANGEROUS HEAT IS EXPECTED. THE COMBINATION OF HOT TEMPERATURES AND HIGH HUMIDITY WILL CREATE HEAT INDEX READINGS OF AT LEAST 105 DEGREES AND VERY WARM OVERNIGHT TEMPERATURES. DRINK PLENTY OF FLUIDS...STAY IN AN AIR-CONDITIONED ROOM AND STAY OUT OF DIRECT SUNSHINE. REMEMBER...THE ELDERLY...VERY YOUNG...AND PEOPLE WITH HEART CONDITIONS ARE MOST AT RISK IN EXTREME HEAT. FRIENDS... RELATIVES... AND NEIGHBORS SHOULD CHECK ON PEOPLE WHO MAY BE AT RISK. It's only mid-June and the weather only gets hotter over the next month or two. 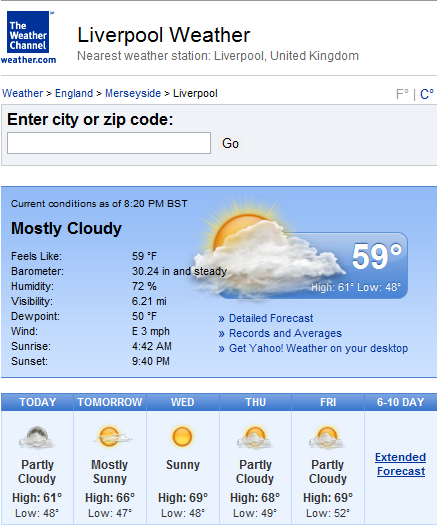 I also took a look at the weather for here and for Liverpool (my home town) over the next week. Admittedly, they're 5 hours difference, so while we're at the high point here today, and Liverpool is already cooling down, look at the 5-day forecast. It's quite a difference. It brings to mind the old saying - Only mad dogs and Englishmen go out in the noonday sun. If you don't get quite what it means in real terms, this is a photo of my living room clock, which has internal and external temperatures (the external sensor has a flat battery). The room has no AC but the windows are open, and the clock is mounted just above head height. 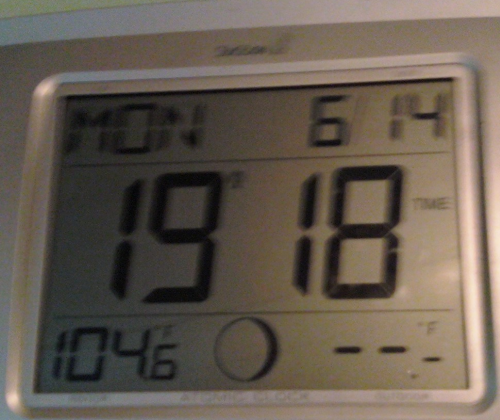 104.6°F is 41.3°C. We don't enter that room unless we need to!